Getting into the Christmas spirit is easy with a little holiday cheer from Erin Harpe & The Delta Swingers: The Christmas Swing. The 10-track Blues album featuring Erin Harpe, Jim Countryman, Matt "Charles" Prozialeck, and Chris Anzalone with Special Guests: John Juxo and Richard Rosenblatt released on the VizzTone Label Group /Juicy Juju Records/Squirrelygirl Music is a mix of new and old-time favorites that are sure to get your holiday party started in style. Erin Harpe & The Delta Swingers - The Christmas Swing was produced by Erin Harpe and co-produced by Jim Countryman on the Vizztone Label Group/JuicyJuju Records/Squirrelygirl Music. Erin Harpe & The Delta Swingers - The Christmas Swing is the band's first holiday album and they clearly have fun with it. The release opens with the traditional Jingle Bell Blues however the arrangement and Erin's vocals give it a rocking fresh feel. Next up is the song, Merry Christmas, written by Joe Luke, that is the perfect blend of the Blues. Erin Harpe shows off her arranging prowess as well as her guitar finger-picking finesse on the song, The Night Before Christmas, which kicks it up a notch with Matt "Charles" Prozialeck layering in the harmonica as acomplement to Erin's vocals. The playlist continues with the 1925 Fred W. Longshaw song, At the Christmas Ball made famous by the "Empress of the Blues" the late, great Bessie Smith (1894 - 1937) and features John Juxo on piano. There lease picks up the pace with the Lou Psyche song, Merry Christmas (Here I Come), which has a vibrant Zydeco feel. The title track, The Christmas Swing written by Erin Harpe and Richard Rosenblatt opens with Chris Anzalone setting the pace with a pumping drum opening and gets an extra helping of holiday spice from Richard Rosenblatt on harmonica. Next up is the traditional song, Christmas Is A-Comin' written by Lead Belly in the 1940s, followed by the Bo Carter song, Drink and Get Drunk, which definitely sets this release apart from other holiday albums. Erin Harpe and the band have fun with the rollicking 1958 Johnny Marks and Marvin Brodie song, Run Run Rudolph and make it their own before closing out the release with the traditional New Year's Eve song, Auld Lang Syne. Happy Holidays to all! 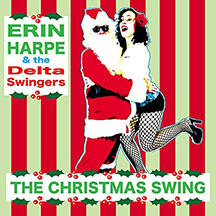 Websites where you can procure Erin Harpe & The Delta Swingers - The Christmas Swing: Erin Harpe Store, Amazon,and iTunes. © November 2018. LuxuryExperience. www.LuxuryExperience.com. All rights reserved.